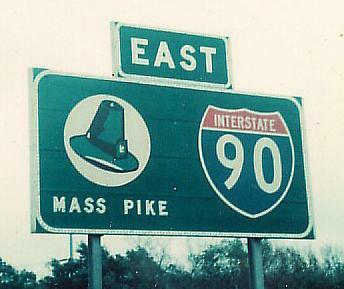 If it's 1970, you don't even use the MASS PIKE abbreviation. 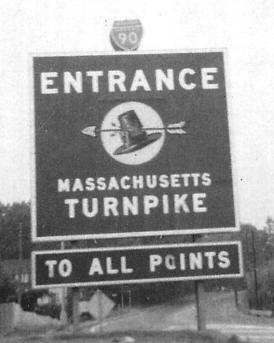 In fact, you use a state-name shield (which may already have been an obsolete practice even then, which would explain state-name shields' extreme rarity) and the original Turnpike logo, and proclaim that the entire universe can be reached via this one toll road (so pay up). The arrow through the hat was judged politically insensitive, but I don't see why - after all, it shows the Native Americans actually scoring a point against the European infiltrators. Again courtesy Michael Summa. Both tickets are from the short time when there was no toll charged for the first several exits, at least for passenger cars. This was done as a service to residents of Western Massachusetts, who need to traverse large distances to accomplish things suburban dwellers can do much more quickly, but was reinstated due to needing funds. The first, orange ticket is courtesy Lou Corsaro. I collected the second, gray one at an interesting time - immediately after Hurricane Irene. Travel on the Mass. Pike was free for the day, so I could keep the ticket.